I know what you’re thinking, right? Didn’t you just see a pair just like this a few weeks back? Knee socks? Really? In August? Who knits knee socks in July and August? Well, I do. And I am not alone: Christy and Joyousknits both finished this same pattern in July and Sarah started on a pair too. 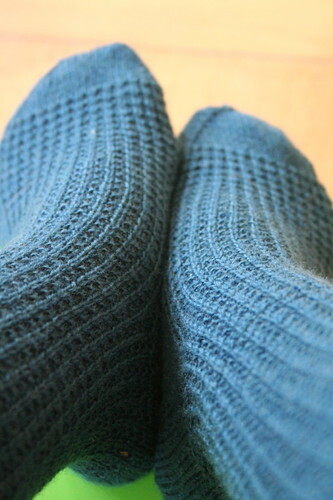 These were the fastest socks I have ever knit: the pair took only five and a half days! Sadly, their rapid production says little about my speed a lot about the hours I spent glued to my books! 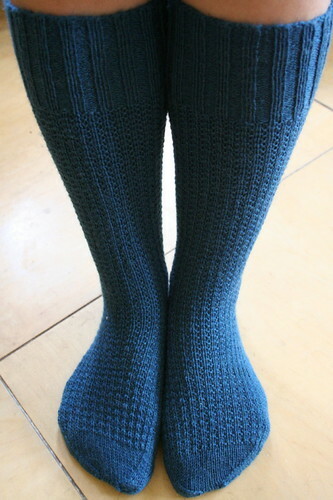 As a bonus, I can cross off another Knitting Vintage Socks pattern: seven down, only 17 to go! I did not alter the pattern at all and I found it to fit perfectly. I most certainly will use this stitch pattern again; it was fast and easy to memorize, involved little purling and produced a firm and not too stretchy fabric. I doubt I will even need to run elastic through the cuffs to keep these socks up but only wear will tell. 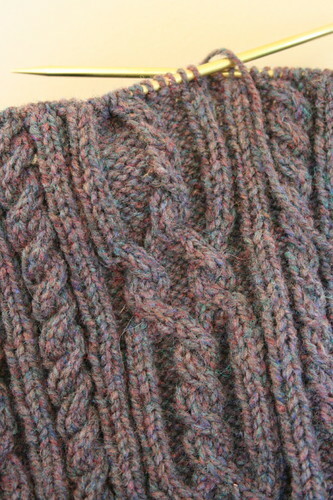 And isn’t the texture of this stitch pattern wonderful? The calf shaping briefly appeared to be too high but the socks fit remarkably well. I imagine the aggressive calf shaping placed higher up the leg contributes to keeping these socks up. I cannot speak highly enough of this sock pattern. 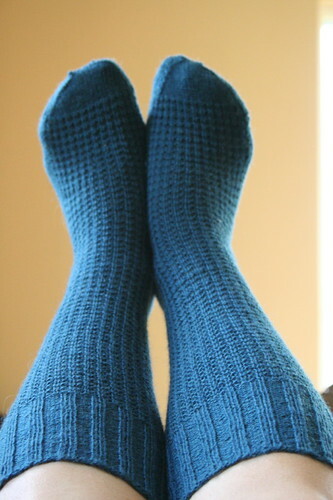 Leave it to Nancy Bush to use a terribly simple stitch pattern to create a snug, well shaped and attractive sock. While not too exciting to knit, this is ideal if you need a good, mindless, on the go sock pattern. Aaron’s Aran is almost to the armhole divide but progress slowed to a halt when I had to rip a few inches. My love for this project has waned a bit purely because I loathe the Addi Lace needles I bought for it. I suppose some people must like brass needles but all I smell is metal: my hands, my yarn and my needles all reek of that awful, metallic smell. Ugh! 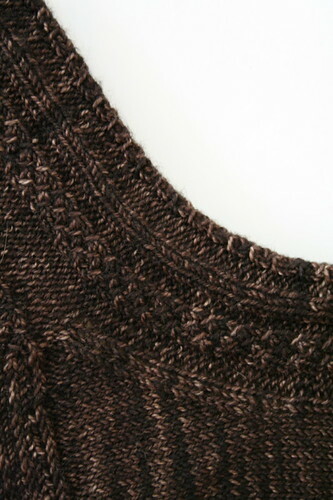 I still love the sweater so I will finish it this fall but I will never buy another brass needle as long as I live. 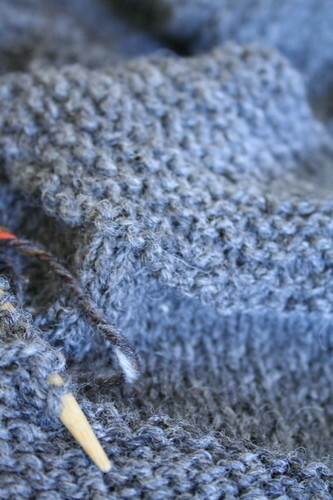 I cast on for a tweedy yoked baby sweater to use up some New England Harrisville yarn I bought to swatch Aaron’s Aran. I will likely need to buy more yarn – so much for a stash buster project, right? The dullest knitting project Katharine Hepburn Cardigan progresses slowly, in large part because of the painfully boring stitch pattern. The back is done and blocked but I only have half of one front done. ONE! 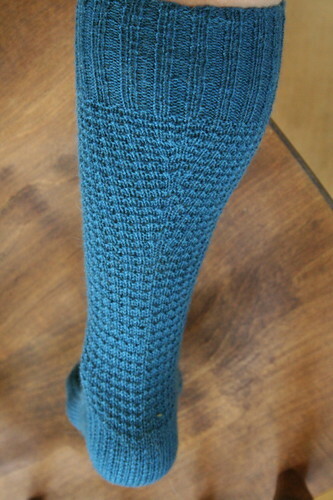 Fascine Braid sock by Tiennie! Go get this pattern! It’s free, easy and pretty! 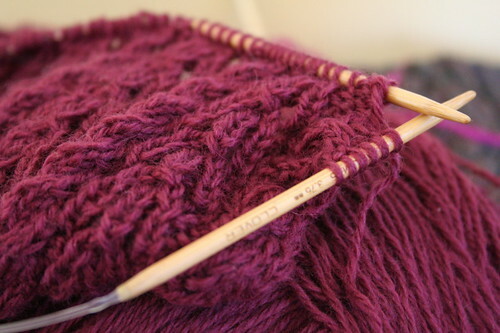 I only wish I had chosen a color other than brown – the pattern is barely visible with this yarn. 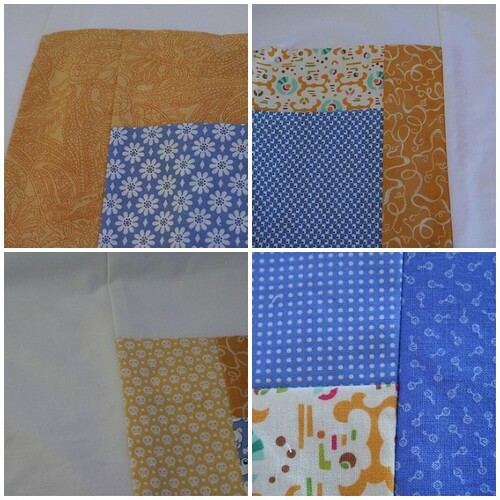 A collection of irregular squares (pieced with scrap fabrics) for a quilt. This is a gift so I likely will not blog much about it until I finish. Next time, there will be some more sewing FOs and a visit by Jennie! Now that I am officially free of the MCAT, the crafting bug has returned in force to ExerciseBeforeKnitting. I have many sewing projects to debut! This first dress is a bit delayed but you don’t mind, do you? Last March, I was feeling a little bored of toddler sewing and anxious for summer to begin so I decided to try my first adult-sized garment. Let us just say that the only nice thing about this dress is the fabric: the sewing is sloppy, the fit is off and the pattern was tedious. Nevertheless, I am still terribly proud of it and will wear it in spite of the flaws. This garment taught me how to select future patterns, the importance of combining sizes and how a great print can hide many errors. I learned that side darts stretching from the armholes to the hips on both sides look easier than cutting separate pieces for the top, middle and bottom, but that’s a dirty, rotten lie. Not only were long darts harder, they were painfully tedious. I’m quite certain most of the work of this dress is in the darts. Small darts on skirts or at the bust are fine but I am officially done with torso-length darts! I also learned not to cut a larger size based on the rationale that it is easier to take in than cut anew. 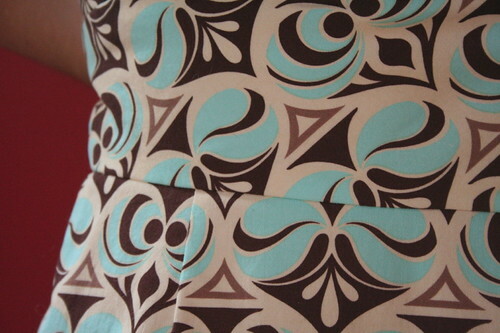 Just because I want a dress to fit does not mean I ought to allow an extra 5/8″ at every seam just in case. With regards to sizing, I tried to get away with only using one size for the top, middle and bottom of the dress; this was a fatal mistake. After careful measurement, I discovered I need four different sizes at various points. Not two, not even three, four. This made me reconsider what kind of dress to choose. If I wanted a fitted dress, a darted, one-piece dress probably was not the best choice. 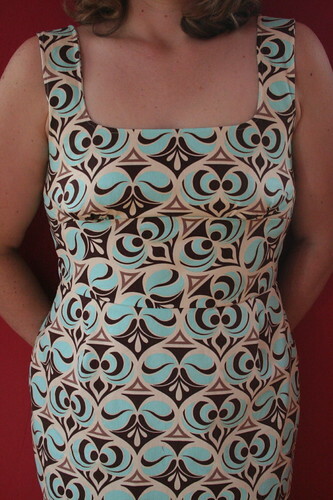 For the next dress, I selected a pattern with multiple pieces so I could customize each to fit. I started this dress earlier this summer and although I had little sewing time, I snuck a seam or two in here and there. I finished this the day after my exam. Since I used so many different sizes, I worried they would not join well together but I hardly noticed a problem. Modifying the pattern to fit was so easy to do and ultimately, more satisfying than cutting a larger size to (sort of) fit. But tell me, does it look like I’m wearing an evil version of the Nike swoosh? 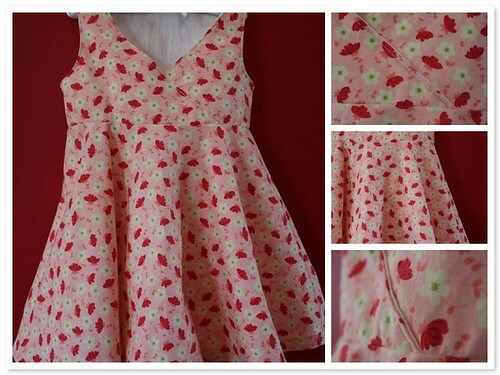 That’s what I see in this fabric, although I like the overall effect! It took me a long time to get these straps right. I still might shorten the right strap a little, as it does not feel as snug as the other one. I was worried that the middle piece would look strange, since it is cut on the bias when the top and bottom pieces are not. I think the difference adds a bit to the garment overall, plus it makes for a more stretchy piece. My only regret is that the skirt is a smidge too big – I probably should have dropped down one size but having a little extra room never hurt anyone, right? This is a weird angle but I wonder if this is how I look to tall people? Specifically, to Aaron, since he is 13 inches taller than me! There may be more dresses to come but I think I will stick to faster, easier projects (like skirts) for now. But who knows? 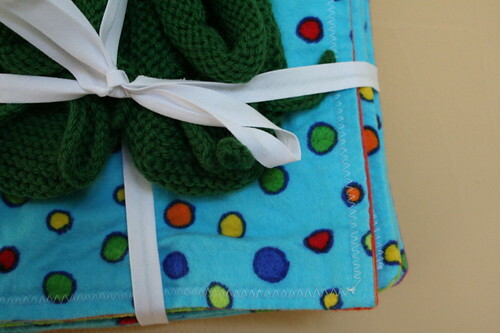 There may be time-consuming, harder projects (like quilts) waiting in the wings! With less than a day left before the exam, I thought I’d take a quick break from practice tests to pop in to say hello. And thank you, for providing me with plenty of quick diversions by blogging and posting your lovely photos on Flickr and on Ravelry. Whenever I need a short break, I stop and read some blogs, see out what my contacts are up to on Flickr and check email. I have so many unblogged projects (mostly things I finished in late spring or early summer) to show you that I will probably have to break them up into several posts. Let’s start with kid sewing, shall we? Made for gimmesanity’s Monkey, a brand new big sister. This is one of my favorite patterns ever. You may recall that I used this same pattern for Celeste’s sundress last fall. 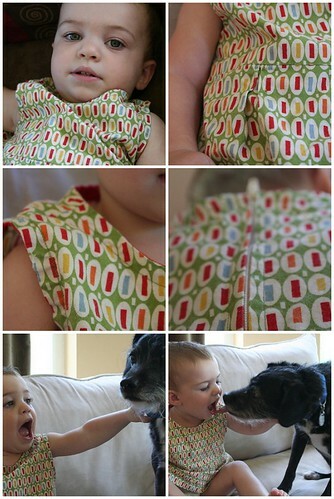 I also made Beatrix a dress with this pattern last summer; however, she outgrew the dress before I could photograph it. In any case, I thought it would be nice for the big sister to get something special (other than, of course, a new sibling!) And what kid does not love to twirl? The only significant modification I made to the pattern was to omit the side zipper. 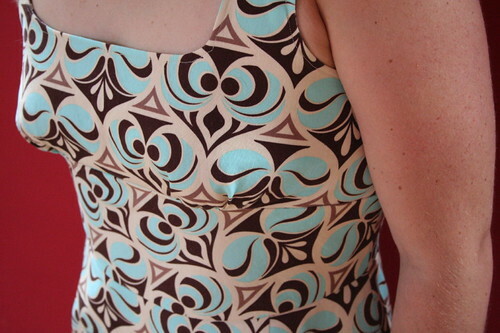 This pattern calls for an invisible side zipper that stops short of the underarm. I’ve placed the zipper in the past but it does not add anything to the garment, in my opinion, so I skipped it. For the new baby, I made a quick pair of booties and a stack of square flannel wipes. I made stacks and stacks of these before Beatrix was born and we still use them every day. I pulled out my stash of flannel and sewed up some more wipes for the new babe. Finally, back in early June I made another light dress for Beatrix. Pattern: Butterick 3782 just like the blue daisy dress I made a few months ago. I actually sewed the two dresses at the same time but this one seemed to be in the wash whenever I had a chance to photograph it. I managed to bribe Beatrix to sit still long enough to take the pictures. The bribe? A steady stream of dog kisses. Ew. While I normally use doublefold bias tape to hide my unsightly neckline and armhole seams, I decided to try using singlefold bias tape as facing. I couldn’t be happier with the result! 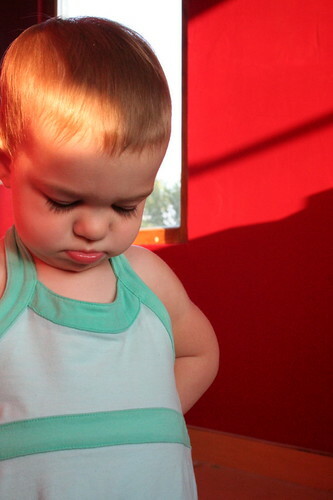 I dislike messing with linings and facings on summer dresses for a growing toddler so tape facings effectively clean up the edges without much extra work. To cotton purists, I’ve learned, using pre-fab tape is like lining your knits with a wool/acrylic blend; however, at the rate B is growing, the fiber content of the facings will not matter much. Speaking of Beatrix, look who is developing some attitude! And right on time too, with her second birthday only a week away. That’s all for kid sewing. There will be some quilting, some adult sewing and sock knitting coming your way after the MCAT. Until then, wish me luck.